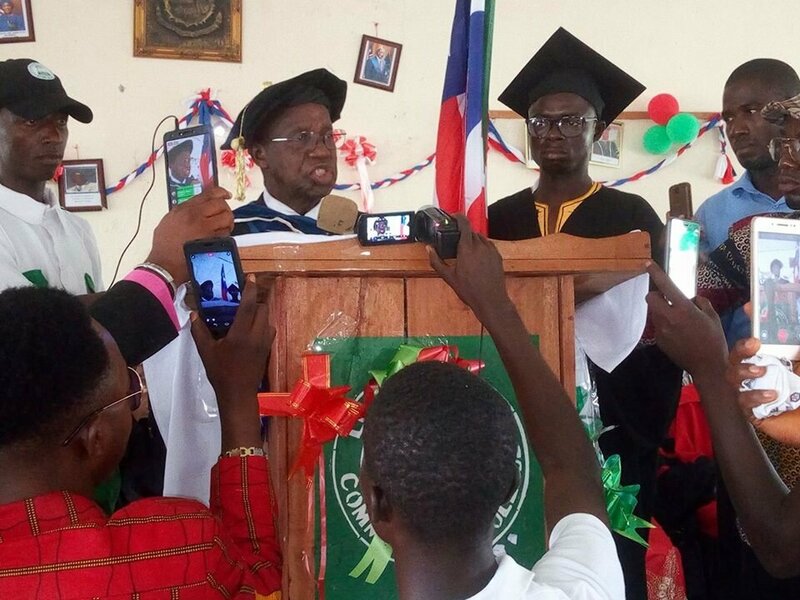 The quality of academic students and not quantity of students will be the focus of the Lofa County Community College (LCCC), the newly inducted President of the College has said. Delivering his induction speech in the provincial capital, Voinjama over the weekend, Dr. Samuel K. Ngaima, who praised President George Weah for the opportunity to serve, indicated that even though quantity increases finances of the institution, he believes that quality increases standard and integrity. Excellence in leadership and stewardship stands to lead our nation to produce man and women who will be the hope of a better Liberia,” the new LCCC President said. He said his leadership intends to raise the standard in such that every near future admission into the institution becomes competitive. “We hope to employ high caliber of teaching staff to train and mentor our students, who will graduate with the capacity to compete with others anywhere in the world,” he emphasized. According to Dr. Ngaima, the problem with the educational system of Liberia is the failure of educational institutions to teach their students how to organize and use knowledge after they have acquire it. He also disclosed plans to put into place what he called “Critical Thinking” as a core subject for all students. “We will review our curricula to make our programmed more relevant to everyday life, partner with industries, companies and communities so that the Lofa County community College becomes an institution where the discovery, dissemination, and application of knowledge are systematically balanced and will also accelerate and sharpen international strategy by focusing on the strategic development of partnership with key international academic alliances,” the new LCCC President stated. Touching on the issue of funding Dr. Ngaima describe funding as the driving wheel of any academic institution and as such indicated that any educational institution that cannot assemble the critical means of financial resources and necessary intellectual capital cannot ultimately compete on the national and international scene. “This is one of the reasons the LCCC must increase its resources substantially in terms of both intellectual capital and financial strength and this can be done both internally and externally,” De. Ngaima said. His acceptance of the post of President the college, he said means he is prepared and ready to take the LCCC to the next level for the betterment of the county and the country at large. According to him, it is a challenge that requires wisdom, patience and good administrative skills in order to deliver results. “Salary inequality is a major problem of dissatisfactions among the workers. Therefore, employees with the same qualification and position are paid at different salary levels. This situation must require urgent attention to assure smooth operation of the departments”. The newly inducted president in conclusion then advanced seven recommendations to move the institution forward. They include measures to control the college expenditures in order to increase and promote fiscal discipline and proper accountability, as well as obtain the best value for money; and that the issue of huge salary discrepancies among employees be harmonized based on positions and qualifications. Dr. Ngaima also called for the establishment of a business college at the institution and that the Zorzor Rural Teachers Training Institute (ZRTTI) own by Government and currently offering C-certificate should be amalgamate with the Lofa County community College in order to award a bachelor’s degree in education. He finally appealed to the Board of Trustees of the College to devise ways by which various districts in Lofa can contribute to LCCC in addition to government of Liberia’s financial support. The Lofa County Community College was established in 2010 by an Act of the 52nd Legislature of Liberia, with four training programs referred to as Departments of Agriculture, Health Sciences, Education and Department of Engineering and Applied Sciences.